With the growth of technology, many tasks that seemed impossible a decade ago have become achievable and that too in a matter of minutes or seconds. The effects of technology and the use of it however, have not always been for a good cause. Many a times, people or certain groups, for the sake of their selfish desires, have used the technologically advanced equipment and gadgets to their own advantage in a way that they have been harmful to others. Also, sometimes the technology or substances used are such that they are beneficial if used properly but can be harmful if abused or mishandled. To counter this, the same technology and its inventions have been used to find out when technology is used in such a way. This system includes many helplines such as 911 as well as other emergency numbers and codes that can be used to warn people about the happening of something bad. On the other end, common people can also use some of these services to inform the authorities regarding any illegal or harmful act that they may be subjected to. Two such mechanisms or emergency numbers are the hazard identification number and the hazchem code or emergency action code. Both of these are more like warning symbols that can warn people about the substance in store that can be harmful if not handled properly. The Hazchem is a system of warning plate that is used in a number of countries such as Malaysia, Australia, the United Kingdom and New Zealand. They are used for vehicles that transport hazardous substances. They may also be used on storage facilities. The code is a certain standard that is followed internationally and the pattern is kept the same so that it can be inferred globally. The top left hand section of the plate displays the EAC, that is, the Emergency action code. This tells the fire brigade what sort of action to take in the unfortunate event of an accident. Then comes the middle left section that displays the UN substance identification number which describes the chemical that is contained within the vehicle or storage facility. The lower left hand section gives the number that should be dialled for any assistance regarding handling or disposing the chemical if need be. In the top right hand side is a warning symbol that denotes the type of danger the particular chemical can present. Last comes the bottom right hand side of the plate that carries the logo of the company. Sometimes, the standard null Hazchem plate is used that indicates the transport of substances that are non-hazardous. This null plate lacks the EAC or substance identification code. The Hazard Identification number is used on placards especially in Europe for road transport. The placard is made to have an orange background. The figures, the border and the horizontal line dividing the two codes are black. The number in the upper box indicates the type of danger whereas the number in the lower box is used to identify the substances. This identification is on the basis of the UN number that is mentioned in the UN recommendations on Transport of Dangerous goods. The Hazard Identification Number usually consists of 2 or 3 figures that indicate various hazards. Some examples include 20 for inert gas, 22 for refrigerated gas, 23 for flammable gas, 26 for toxic gas, 362 for a flammable liquid that is toxic, 50 for an oxidising substance that can intensify fire etc. What do sections denote: Hazchem top left hand-EAC, middle left-UN substance identification number, lower left-number that should be dialled if any assistance regarding handling or disposing the chemical is needed, top right-warning symbol that denotes the danger of chemical, bottom right-logo of the company; Hazard Identification Number: The number in the upper box indicates the danger, lower box is used to identify the substances. allana. 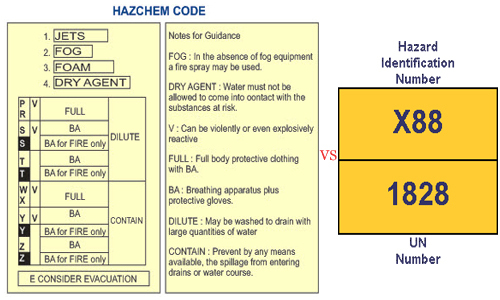 "Difference between hazard identification number and emergency action (hazchem) code." DifferenceBetween.net. November 6, 2014 < http://www.differencebetween.net/business/difference-between-hazard-identification-number-and-emergency-action-hazchem-code/ >.